Here is the “Master Boiler”, who has built a wood fire under a large kettle, added whole red potatoes, sweet whole onions, and salt. The salt serves to increase the boiling temperature. When the veggies are done, the Whitefish is added, having been freshly caught by local fishermen in Lake Michigan. The oil from the fish begins to rise to the top, necessitating the need for a “boil over”. This is done in order to burn off that oil, so that it does not adhere to the food as it is served. 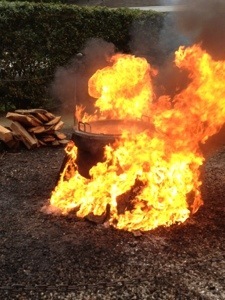 The Master Boiler throws a container of diesel fuel into the wood fire underneath the kettle. Immediately a huge fireball ensues, engulfing the entire kettle. The kettle is then removed by two men with a metal pole, brought to the kitchen, and the food is immediately served. 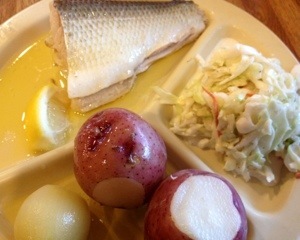 The meal consists of the fish, potatoes, onion, homemade coleslaw, and a variety of bread. Many people choose to douse their fish and veggies in butter and/or lemon (I did!). I ordered the lite eater’s version. You can get a larger plateful if you wish. Dessert consists of homemade cherry pie made with fresh local cherries from a nearby orchard. I must admit I had my doubts about boiled fish, but I must say it was very moist and delicious! 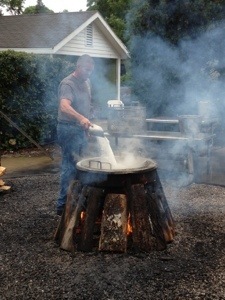 I would recommend a fish boil if you ever travel to Door County, it was an interesting and yummy experience! This entry was posted in daily muse, fish, main dish, restaurant link and tagged Door County, Door County Wisconsin, Fish, Fish Boil, Lake Michigan, United States, Wisconsin. Bookmark the permalink.